Paddle along majestic limestone cliffs and enjoy Lopud island famous for its sandy beaches. Cliffs and Beaches is an easygoing sea kayaking tour in Dubrovnik with a treat awaiting - perfect places for cliff jumping and lounging on big sandy Šunj beach. 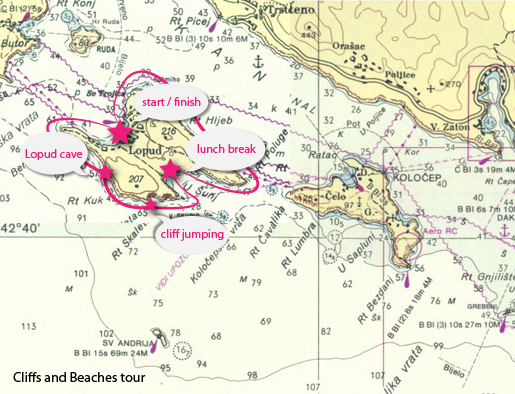 Starting from the Dubrovnik Harbor — Gruž — you’ll take the ferry to the island of Lopud. After instructions about kayaking techniques and safety, we’ll begin our circumnavigation of the island, which is famous for its sandy beaches. Paddling to the southwest, you’ll immediately have views of majestic limestone cliffs towering above. But these Karst phenomena also have a hidden treat awaiting: caves. Our guides will steer you to some of these secret getaway spots, where we can snorkel inside and get an insider’s perspective of the island’s formation. For those brave souls who also want a bird’s-eye view, these are perfect and safe places for cliff jumping. At the halfway point of our excursion, the group will stop for a lunch at the sandy beach of Šunj. After, we’ll swim, lounge, or try the popular traditional game picigin, something like free-form volleyball played in the water. Refreshed, we’ll complete the round trip journey before heading back to Dubrovnik in the late afternoon. We meet in Gruz harbor, Dubrovnik’s commercial port, to board the morning Jadrolinija ferry. Gruz is a 35 minute walk or a 10 minute bus ride (bus 1A, 1B, or 3) which depart every 10 min from Old City’s Pile Gate (west gate). 15 Kuna to the bus driver or buy a 12 Kuna 1 way ticket at the kiosk.